Turn your fave burger into a dip with this Bacon Cheeseburger Queso recipe. 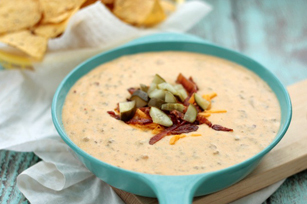 All the classic flavors are melted together in this delicious Bacon Cheeseburger Queso. Brown ground beef over medium heat. Do not drain grease. Sprinkle flour over beef. Stir well and cook for 2 minutes. Stir in milk and increase heat to med-high. Stir frequently until bubbly and thickened, about 6-8 minutes. Reduce heat to low and stir in cream cheese, mustard and hot sauce. Add grated cheddar and stir until cheese is melted and well combined. Stir in bacon. Top with chopped pickles. Serve with tortilla chips. This warm cheesy dip is great for a special occasion, such as a family party, since it makes 28 servings.